University of Nevada Press, 9780874179217, 208pp. Sid Dulaney, in his mid-thirties, between jobs and short on funds, has moved back to Tucson to take care of his beloved grandmother. To hold down the cost of her prescriptions, he reluctantly starts smuggling medications over the border. His picaresque misadventures involve the lovable eccentrics at her retirement village, Mexican gang threats, a voluptuous former babysitter, midnight voicemails from his exasperated ex-girlfriend, and, perplexingly, a giraffe. This first novel by the winner of the Iowa Short Fiction Award proves Waters is an important new voice in American fiction. 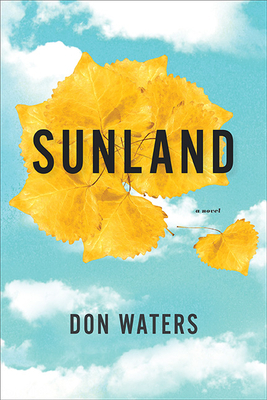 A big, rollicking, character-filled novel, Sunland is an entertaining and humane view at life on the margins in America today. Don Waters won the Iowa Short Fiction Award for his story collection, Desert Gothic. His fiction has been anthologized in the Pushcart Prize, Best of the West, and New Stories from the Southwest. His journalism has appeared in The New York Times, the San Francisco Chronicle, and Outside. Born and raised in Reno, Nevada, he currently lives in Portland, Oregon. Sunland is his first novel. "His debut novel is a Tucson-centered gallop that traces a failed high school English teacher who, like so many we know, moves here to care for Grandma. Soon he's running cheap prescription drugs over the border for retirement-community old-timers. Tim Sandlin-style hilarity ensues, against a heartbreaking backdrop of the Sonoran Desert and deceptively profound and kooky characters we develop little crushes on."